Wall of Wind (WOW) blasted hurricane-force winds on a scaled down model home, and the result was captured on film. The demonstration was produced for IMAX, which chose to film at WOW for an upcoming movie on hurricanes. The exercise is also a good reminder to people who live in areas affected by hurricanes that they must prepare their homes when a storm is coming. 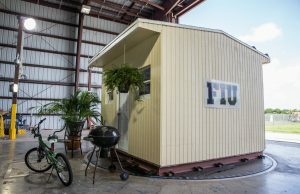 WOW researchers built a small house that on one side was fortified with hurricane shutters and a reinforced roof, and the other side was not. 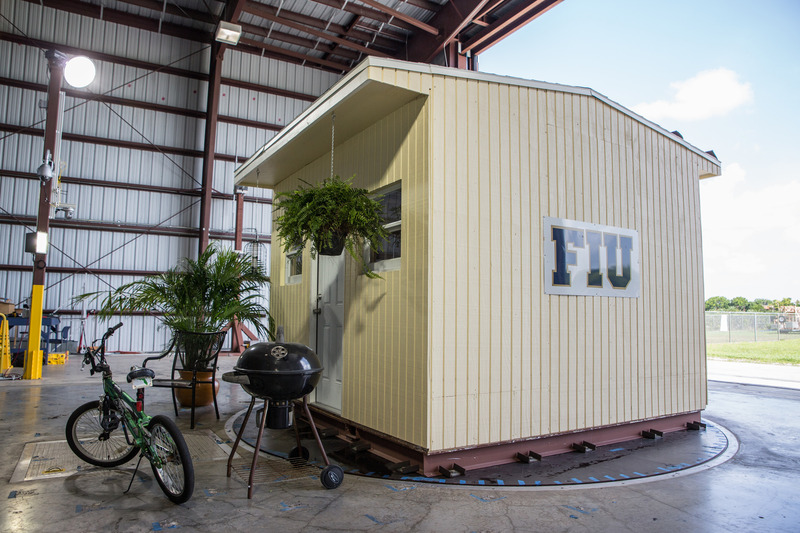 Additionally, items that homeowners might typically leave outside during a hurricane, like a barbecue grill, potted plants, patio furniture and a bicycle were part of the demonstration. First, the fortified side was exposed to hurricane-wind speeds, and the structure held up as expected. Next, the structure was rotated to expose the unfortified side and household items, and then hurricane-force winds were introduced again. The house came apart, and the items along with parts of the destroyed home, became flying debris, further demonstrating the importance of proper hurricane preparation and proper building codes. IMAX’s visit put the spotlight on the WOW’s wind engineering researchers at the International Hurricane Research Center and the College of Engineering and Computing, and the important work they do to ensure buildings and other structures are built to withstand hurricanes and keep the people who live in them safe. The live demonstration was made possible by the Florida Division of Emergency Management, through an annual residential construction mitigation grant. The National Science Foundation-funded WOW is one of seven labs in the country with an Experimental Facility designation under the Natural Hazards Engineering Research (NHERI) program. The next step is for IMAX to film footage of actual hurricanes, and eventually go into the production phase. There is no date for the film’s release yet.